The Korg TM-50TR Tuner is fully equipped with versatile features that will benefit your musical performances. Featuring a tuner, metronome and tone trainer in one compact handheld unit. The Korg TM-50TR is cleverly designed to analyse your playing and improve your sound & technique, and the quality of your practicing. Available in Black and Silver. As well as operating as a tuner, the Korg TM-50TR is also equipped with a tone trainer function that evaluates your sound in great detail. Whilst playing a sustained note on your instrument, this clever function detects the pitch, volume and tonal character of your note. The LED screen allows you to see each of these elements on a graph in order for you to see if your sound is stable, and if it requires improving. This is a particularly great feature for practicing and finding the optimum sound. The Korg TM-50TR Tuner is packed with many features, including a sound out function which provides you with a reference tone to tune by ear.You can select your own choice of reference tone in a three octave range, covering a wide selection of instruments. On the other hand the sound back function allows you to train your sense of pitch. This function works by playing back your note through the internal speaker which is then shown on the LED screen. The benefit of this feature lets you check the pitch by eye and also by ear, thus enabling you to tune your instrument with accuracy. 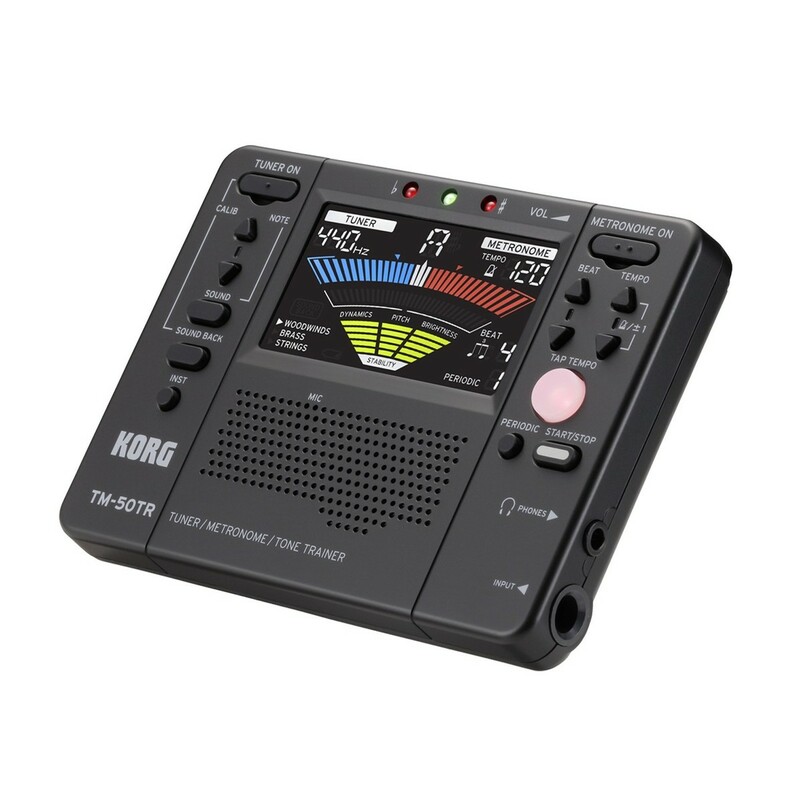 The Korg TM-50TR Tuner wouldn't be complete without a metronome feature, which allows you to tune your instrument as well as keeping time. Built-in to the compact unit is also fifteen rhythm variations with standard time signatures from 0 to 9. Also includes sophisticated rhythms such as duplets, triplets, triplets without the center beat, quadruplets, quadruplets without the center beats. Includes a folding stand on the rear, which provides stability in a free-standing position.